I’m constantly pinning beautiful photos that I’m inspired by to my Photography Pinterest board… I would love to capture my own version of them all. So often when I attempt a photo with a specific composition in mind, I quickly realize it’s not as easy as it looks! …But behind every favorite photo, there’s typically a whole lot more taken in my attempt to capture the vision. Here’s a series of behind the scenes images that I took on this occasion. Although these “outtakes” probably won’t be seen by many, I still love them… I love how they tell the behind the scenes story. …How they show it was NOT this easy-perfect-moment that I just happened to capture, but rather, real life with a 2 year old, and executed with a helper. 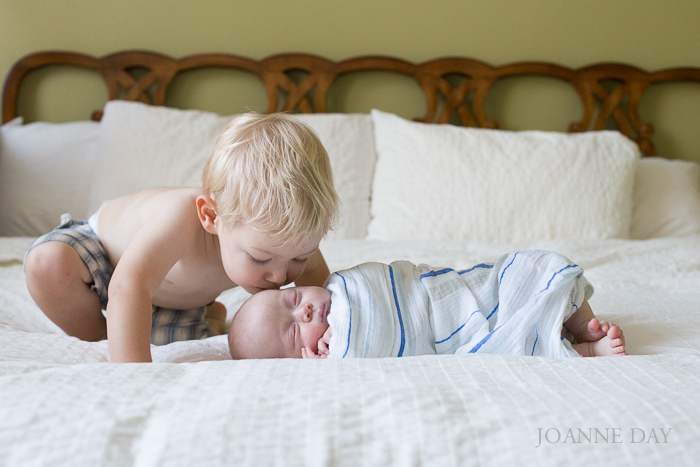 The truth is N is so sweet with his baby brother, and gives him kisses regularly without being asked, but to photograph in the right setting/lighting/background… well, that took effort. Capturing my favorite photos isn’t always easy… but oh so worth it! LOVE this! Capturing the perfect shot is not as easy as some like to make it appear! And it certainly captures the busyness of 2 year olds 🙂 N’s expressions made me laugh..perfect!